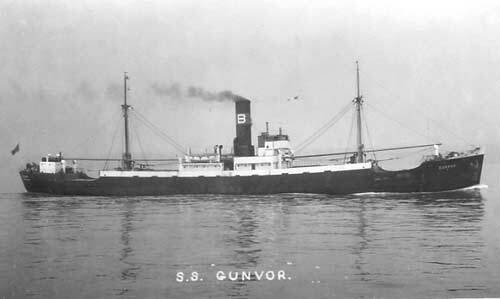 To Gunvor on the "Ships starting with G" page. Picture is from Bjørn Milde's postcard collection. Tonnage: 1942 gt, 1699 net, 3400 tdwt. Built at Trondhjems mek. Verksted A/S, Trondheim (204), delivered in Febr.-1935. Compound steam engine (4 cyl. ), 1115 ihp, 291' 2" x 43' x 20' 1 1/2". (The company fleet list gives tonnages 1941 gt, 1121 net, 3415 tdwt). Captain: Lars Holm Brynildsen. According to this external page, her previous captain, from March-1942 to June 8-1942, was Elling J. Andersen (in other words, he left just before she was lost) - see also Brandanger. Guestbook message from the son of one of the survivors. Guestbook message from some someone whose uncle, Alf Helmersen, served as cook on Gunvor (included in the crew list below). Judging from the information found on Page 1 above, it looks like Gunvor was at Demerara when war broke out in Norway on Apr. 9-1940. She had arrived there from Trinidad on Apr. 7. Gunvor struck a mine in the evening of June 14-1942 (21:45 EWT) in 25N 81 45W, 25 miles north of Key West Light, but not due to enemy actions. The U.S. Marines had laid a giant mine field off Key West from Boca Grande 45 n. miles north and east along Florida Keys, which effectively protected allied shipping against enemy U-boats, but was also a danger to it. 3 merchant ships struck mines in this area in the course of 3 months. She had a cargo of cars, tractors and mail at the time and was on a voyage from Mobile to Trinidad, having left Mobile in the morning of June 11 (see Page 4), but anchored up for the night, then continued along the coast the next morning and anchored up again for the nights of June 12 and June 13. She was on a course 190° true, sailing at a speed of 10 knots. A very heavy explosion occurred in the engine room, port side, killing 2 men there, and the captain was very seriously injured. She listed heavily to port and capsized within 3 minutes. 20 were able to save themselves in the starboard lifeboat, 4 having been picked up from the water. The survivors searched around the wreck for an hour and a half then proceeded to row towards shore, arriving Key West (Trumbo Island?) 14 hours later where they were accommodated at the U.S. Naval Base. The hearings were held in New York on June 26-1942 with the 1st mate, the 2nd mate, the 1st engineer and Ordinary Seaman Eriksen appearing. The captain was still in a hospital in Key West at the time. All the witnesses believed the explosion had been caused by a torpedo (though the water was only 5-7 fathoms in the area). (The Bachke & Co. fleet list places this incident on Apr. 20-1942, quite a gap here - most sources quote the date given above). See this Guestbook message from the son of one of the survivors (name not given). Back to Gunvor on the "Ships starting with G" page. Norway had lost a ship by this name in the early 1900's. Originally delivered in 1895 as French General Mellinet, renamed Gunvor for G. C. Brøvig, Farsund in 1905, ran aground in Apr.-1912 off the Lizzard, voyage Caleta Buena-Falmouth. The text on this page was compiled with the help of: Bachke & Co. fleet list, Finn R. Hansen, "Nortraships flåte", J. R. Hegland, "Sjøforklaringer fra 2. verdenskrig", Volume I (Norwegian Maritime Museum) and misc. - (ref. My sources).